Because apparently I have a substance abuse problem (besides sushi) and I can’t stop. You know, I am not really really racing, but I do treat my weekly racing as the best workout I can do all week. When do you ever go as hard in a workout? If you’re in a race.. then, you do! I believe 100% in racing yourself into race shape! 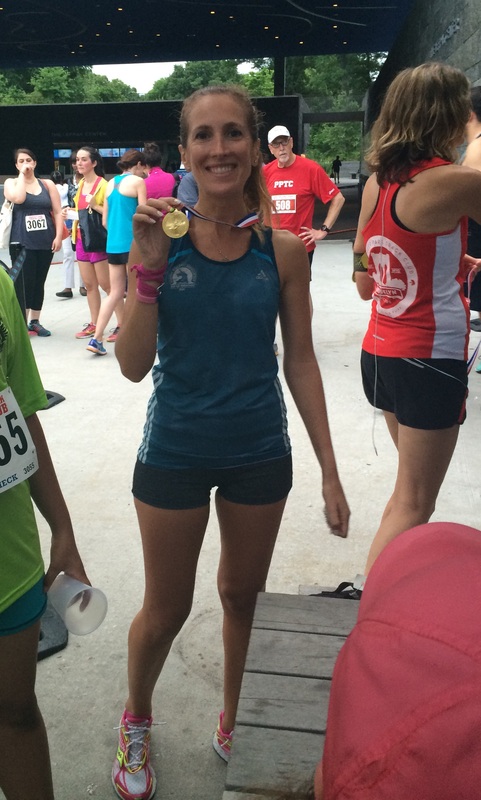 Plus, you do learn a lot about pacing, and nutrition, and gear, etc. Then, there’s the other things, that you can’t figure out… how I do so well when I haven’t slept, or felt like crap, or have a stooopid race when it should have been great or conditions were perfect. Still trying to figure that out, any tips? The fun part about these night races is all the stress about what do I eat? when do I eat it? I do all day. For future reference, I OF COURSE, had sushi at 12 (chirashi, though I skipped the salad), then lots of water and tea and coffee by 4 pm. Then more water. (you watch, next time I won’t remember, won’t reread this, and do something stoopid). Flor, Tessa and I were having a fun time. Turns out there’s this whole new restaurant there at the start in the park, with a big rink and a burger place. So cool. 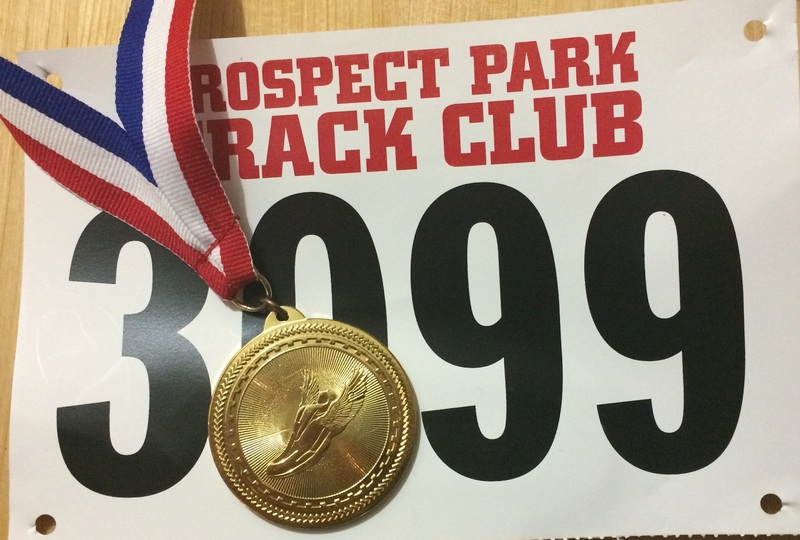 By the way, this race, 3 years ago is my 5K PR, 21:09 from 2012. I went back to check my mile splits, so I’d knew during the race how far off I was. 1: 7:23, 2: 6:30, 3: 7:03. Good to have something to pace off! The race start is a 5 minutes walk down from there. About 6:50 we headed there and then we waited and waited… eventually we got going, I see about 20 women ahead of me, but it could have been 40 or 10, who knows… the first 3 or 4 minutes everyone is just trying to figure out their pacing. Tessa was going to run with me because she swore she hadn’t done any speed since Brooklyn Half and didn’t want to race. AH. I told her, if she felt bored with my pace, or just wanted to, to go. She left me after about a minute!!!! hahaha, so happy to see her go chase her speed! 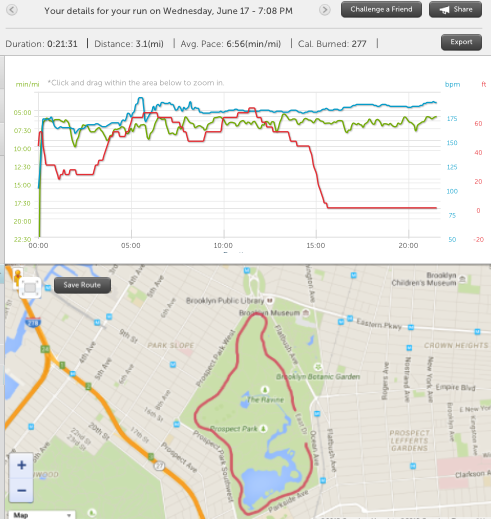 There’s one hill in Prospect Park, and I knew it was on mile 1. I have no idea when I went up the hill: I didn’t even notice it!!!!! ha, when does that happen? Mile 1: 7:24. Well, close to my previous race in 2012!!! OKAY. Mile 2 I passed about 5 women, then, there was just this one girl in the green shirt and I know I chased her down for a LOOOOONG time, but I have no clue if I caught her!!! Mile 2: 6:44. I was really trying. Then I was just running with these two guys and I tried my best to keep it steady and hold it. Mile 3: 6:45. Meh. Not happening. I felt really really flat. 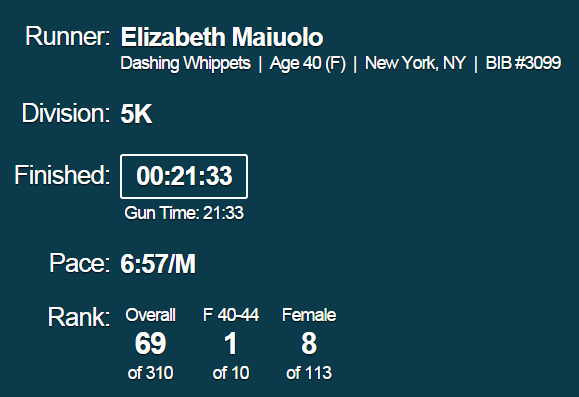 I guess having run a very hard and hot 5K 4 days before is something I don’t recover from that fast. I’ll take it though. I felt ok, just had no kick. I ALWAYS have a KICK!!!!! Finish time: 21:33 officially. 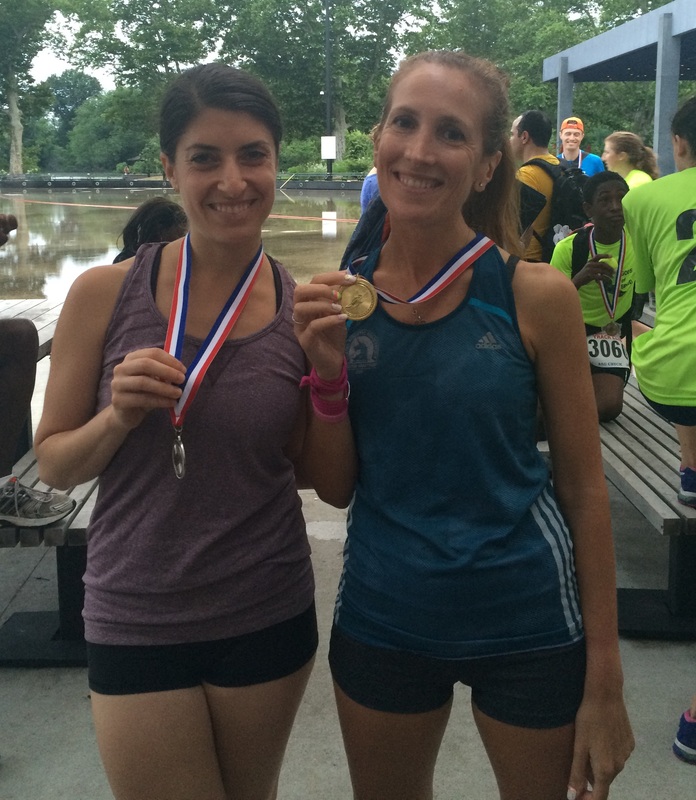 Exactly 3 seconds off last Saturday’s 5K but… weather last night was amazing compared to Saturday… oh well. Still happy with it!!! 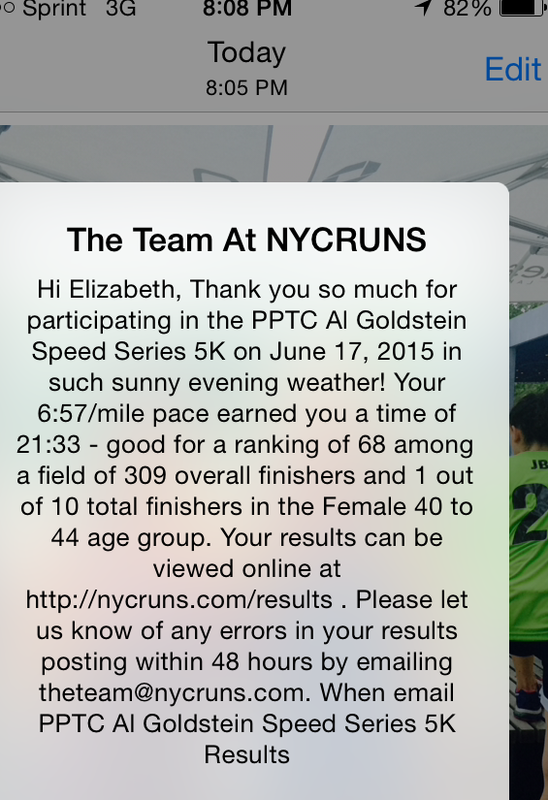 I love that NYC Runs sends you an email as soon as all the results are final with all of it. LOVE this technology!!! and turns out, there were only 7 women ahead of my.. ALL YOUNGER!!! Tessa was 4th overall and first in her AG. SO happy she left me. Sometimes, the races you don’t even worry about are the funnest!!!!! Then they called the grannies, ME!!! I had also won my AG, holy crap, because there’s lots of fast women in PPTC! 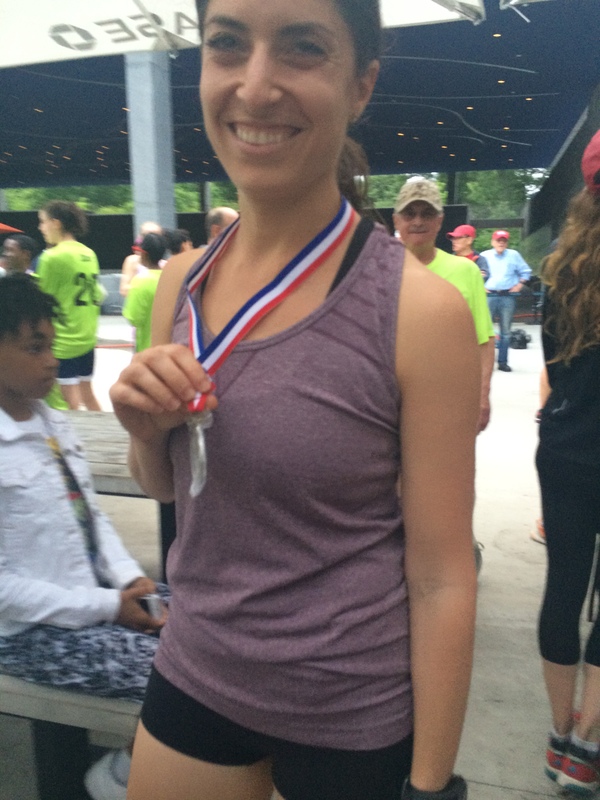 two medals in 5 days!!!!!!!!!! Congrats on your AG win! 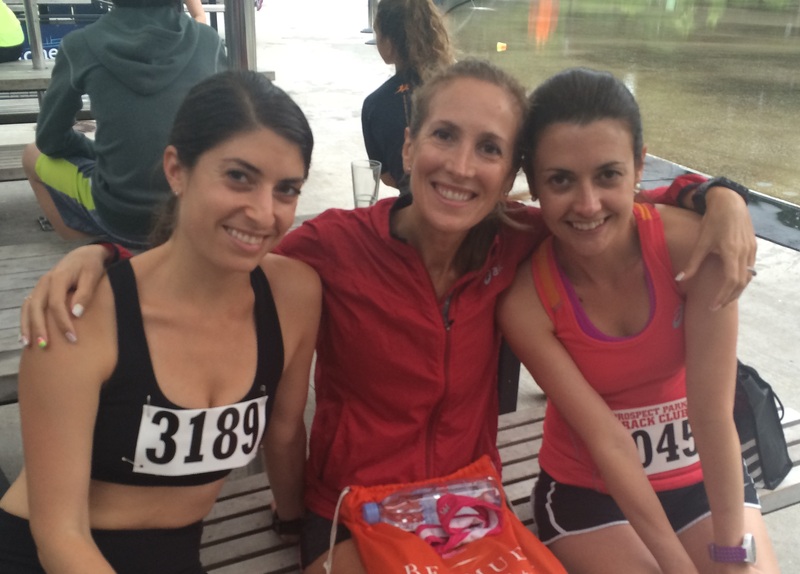 Unless your 2012 splits are wrong, you were actually ahead by 3 sec at mile 3 this year. thanks!!!!! I might have but I had no closing speed… the last 800s or 400s is where the magic stuff happens and I guess I was tired, oh well!